Poran Bondu Re Is One Of The Best Folk Song By Gosto Gopal Das Baul Emperor . Uncrowned Emperor of Baul Song of Undivided Bengal (East & West) is Gosto Gopal Das till date who was born on 8th January,1948 in Hoogly District in West Bengal, India. (unconfirmed reliable source) . He was a famous folk singer of Bengal folk songs known as Palli Geeti, which was enrished by Bhatiyali, Bhawaiya, Jaari, Murshidi etc . The palli geeti are sung in specially in Delta of the Ganges in both East and West Bengal. 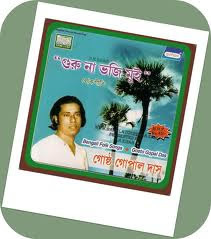 His songs covered all over the world where Bengali speaking or understanding people lives. He had got a lots of filmy songs offer but never accepted those . Gosto Gopal Das' major works are Guru Na Bhoji Mui" which murmured along all villages of East and West Bengal. He created waves in palli geeti in history in bengali folk singing arena by "Chader Gae Chand Legeche,Boli o nonodi and many more. He was died on December 4, 1986 as he left his son Gost Gokul Das who is also a Bengali Folk Singer.